Gender is complex, and even more so at the end of the world. 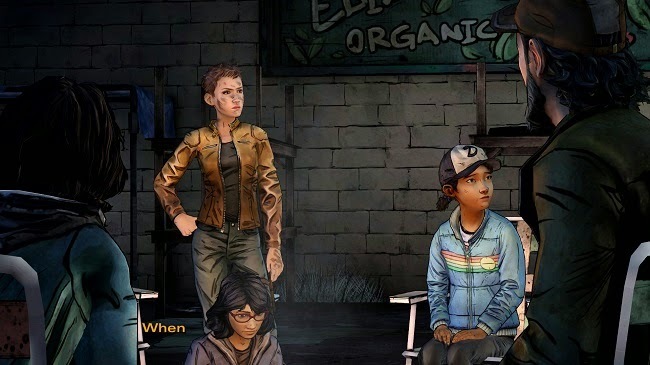 This week on PopMatters, I hopped into Telltale's The Walking Dead yet again. Each episode this season is better than the last, and I am continually impressed at care and consideration they put in the story and the thematic consistency. Their willingness to explore complicated issues, particularly gender and masculinity, is nowhere more clear than in the latest episode. For more on the game, I would actually recommend listening to our debrief on the game here. Scott and I discuss some of these same narrative turns in even more detail, as there's plenty more to explore. In both cases I actually failed to mention Jane in the episode, who offers one of episodes final nails in the coffin that is presumptions faith in gender roles. Troy, one of Carver's lackeys, has the group hostage while a massive horde of walkers approaches. Jane, presumably having a previous history with Troy (the game seems to imply she's been stringing him along as a means of survival), convinces him the two should run away together. Troy, trusting in his own masculinity and Jane's "womanly seduction" lowers in gun and Jane shoots him. Right. In. The. Groin. There is no better metaphor for the failure of masculinity in the world of The Walking Dead. None of this is to say women in The Walking Dead are innocent of projecting societal roles onto others, in fact, that's exactly the point. Everyone, save for Clementine I suppose, rely in some way on their understanding of society before the infection. Common and comforting notions may or may not apply at the end of the world. What makes The Walking Dead so compelling is that its willing to explore these ideas and extrapolate lessons from them that apply to our the crazy end-of-days world we live in today.